Germany comes up with many sweet dishes that can be a dessert or will be enjoyed as a sweet main meal. 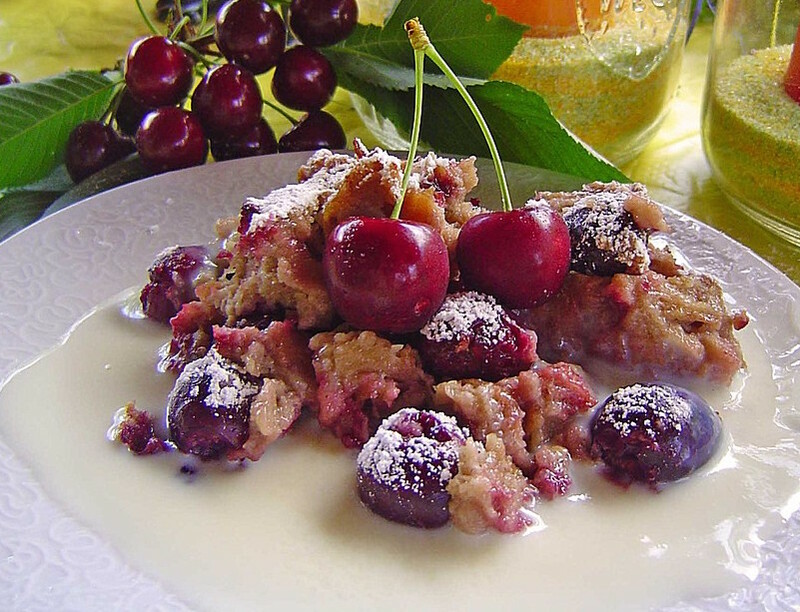 One of these delicious recipes is the German Cherry Dessert or in German "Kirschmichel". You can use fresh or canned cherries. It's baked in the oven and is somewhat similar to the American dish peach cobbler. Serve this German dessert with home made vanilla sauce or vanilla ice cream. Happy Cooking! - Cut rolls in slices 3/4 inches thick, place in a bowl. - Warm milk, pour it over rolls. - Place half of the butter with sugar, egg yolks and lemon zest into a bowl, beat until foamy. Add to the rolls, mix carefully. - Beat egg whites firm, fold in. - place dessert into a greased fire proof form. - Sprinkle top with butter flakes and cinnamon. - Bake in pre-heated oven on medium level for 45 min on 390 F.
Make vanilla sauce per instructions. Serve the Kirschmichel with vanilla sauce or vanilla ice cream.